Unlock your new experience with Crocodile farm, learn the history and culture, try special street foods, and meeting special guest who can swallow the sword (17 inch), and many more. First we will go to The Temple of the Emerald Buddha, take a picture, make merits, and make a food offering to monks. It's breakfast time! Let's enjoy our local Thai rice dishes. Enjoy the local performances and activities; crocodile show, animal observations, museum of dinosaur. Then, have lunch. Back to Khaosan road, we'll take a boat ride to sightsee Bangkok at its dusk. We'll have the most common Thai dishes the locals always order: Tom Yum Goong, Pad Thai, and many more. 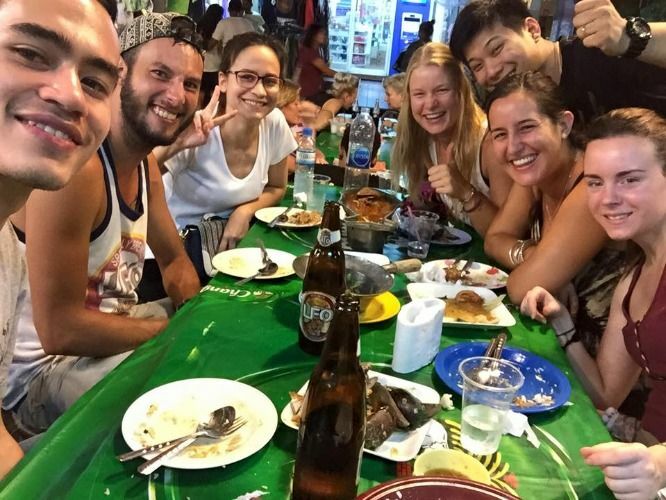 You get to explore Bangkok to the extreme in only a day; a temple, a crocodile farm, a boat ride, street foods, a night out, etc. Plus, I'll take some nice footages of the tour, out them together, and send it to you later as a keepsake. Not only you can visit many places in one day, but also get to see something thrilled like the crocodile shoes or the sword swallower. He is invited specially for you guys. Also, I will be recording a video of our trip and send it to you afterward.